My daughters turned four the other day – a baby no more. She celebrated in fine style with much merriment and sugary treats. 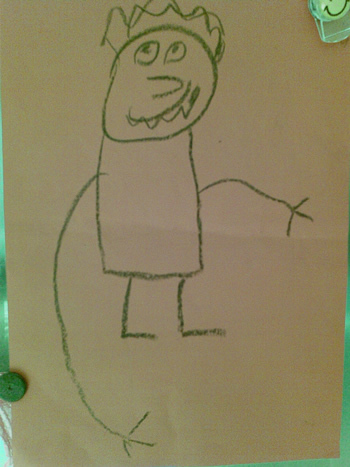 She also drew a splendid picture of me. A fine likeness (not that most of you know) and one that now holds pride of place on the fridge door. She’s captured me, I think. Incidentally, that huge arm is no accident. She specifically pointed out that it was dad’s big arm. I was under the impression that my arms were fairly similar in size but apparently not. The reasons were explained to me: that is the arm that she likes to cling to, arms and legs crossed around the forearm monkey-style, while I lift her in a sort of ‘biscep curl’ action. I did it once when she was little and she still asks me to do it now and then. It gets harder as she gets bigger and I get older. That’s an arm long enough that would match Michael Phelps very own wingspan. You should be proud. Proud indeed, Ister. Proud indeed.